You simply cannot make this stuff up. When will we learn and put a stop to the “Islamization” of this country? CAIR needs to be designated as what it is. A terrorist organization. Simple as that. It would be a GOOD step towards keeping this country safe. 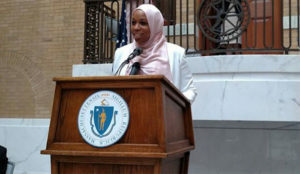 Amatul-Wadud is a “board member for the Massachusetts Council of American-Islamic Relations.” CAIR is an unindicted co-conspirator in a Hamas terror funding case — so named by the Justice Department. CAIR officials have repeatedly refused to denounce Hamas and Hizballah as terrorist groups. Several former CAIR officials have been convicted of various crimes related to jihad terror. CAIR’s cofounder and longtime Board chairman (Omar Ahmad), as well as its chief spokesman (Ibrahim Hooper), have made Islamic supremacist statements about how Islamic law should be imposed in the U.S. (Ahmad denies this, but the original reporter stands by her story.) CAIR chapters frequently distribute pamphlets telling Muslims not to cooperate with law enforcement. CAIR has opposed virtually every anti-terror measure that has been proposed or implemented and has been declared a terror organization by the United Arab Emirates. A CAIR operative recently called for the overthrow of the U.S. government.